On November 5, 1880, an eruption located near the 11,000-foot elevation, about a mile above Puʻu Ulaʻula began on Mauna Loa’s northeast rift zone that would eventually send lava closer to Hilo Bay than any other in over a thousand years. May 1st, 1881, a small, short-lived eruption at Mauna Loa’s summit heralded the beginning of an eruptive sequence that was to be followed six months later by the voluminous flank eruption which would soon threaten the then-small town of Hilo. “Without delay a council, high and solemn, was held in Honolulu by the principal natives; and Princess Ruth, or Luka, as her name was in Hawaiian, a lineal descendant of Kamehameha the Great, the conqueror of all Hawaii, was dispatched to offer compelling sacrifices to the goddess”. Having lost her house, Princess Ruth Luka Keanolani Kauanahoahoa Keʻelikōlani sought to rebuild. The area where the home was located was known as Kaʻakopua. “Drawing those plans from among many others she said in her imperious manner to the architect standing nearby, ‘Build me a house like that.’” (Hawaiian Gazette, October 1, 1895) Thus began the construction of a home; she named it Keōua Hale. The main architect behind new structure was Charles J. Hardy, an American from Chicago, employed at the Enterprise Planing Mill in Honolulu. The gaslit interior of the mansion was celebrated for its ornate plaster work and frescoes. 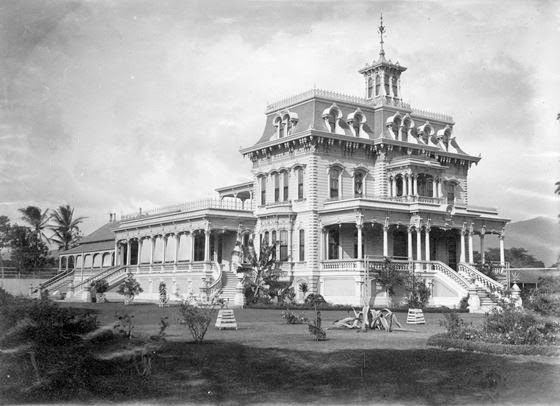 It was the most expansive residence of the time; it was larger than ʻIolani Palace. The house was completed in 1883; however, Princess Ruth Keʻelikōlani never lived in the palace. She became ill immediately after the house warming and birthday luau. She returned to Huliheʻe, her Kailua-Kona residence, where they believed she would more quickly regain her health. On May 24, 1883, Keʻelikōlani died at the age of fifty-seven, in her traditional grass home in Kailua-Kona. But the house was not destined to be the home for Kamehameha Schools. Rather, it had the honor of serving as the campus of the first public high school in Honolulu. However, the idea of the purchase was not without its detractors. In 1907, Honolulu High School moved out of Keōua Hale to the corner of Beretania and Victoria Streets. The school’s name was then changed to President William McKinley High School, after President William McKinley, whose influence brought about the annexation of the Hawaiian Islands to the United States. The educational needs of Honolulu exceeded the space of Princess Ruth’s palace for several reasons. In 1920, a report was published on the survey of schools conducted by the Bureau of Education of the Federal Department of the Interior. The report noted that typical middle class families in America were sending their children to public secondary schools, but in Hawaii, public schools were so few and geographically isolated, that many had to go to private schools or were forced to drop out. Though now called Central Middle School, as you drive down South Kukui Street (between Queen Emma Street and Nuʻuanu Pali Highway) the name “Keʻelikōlani School” is noted on the building. The image shows Keōua Hale, home of Honolulu’s first High School. In addition, I have included other related images in a folder of like name in the Photos section on my Facebook and Google+ pages.